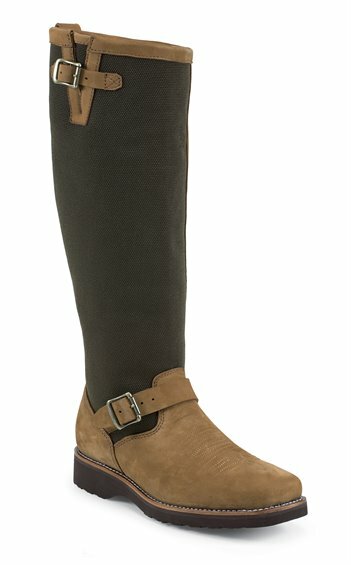 The Bahia is an 18-inch tall men's boot with an olive green woven upper and distressed golden tan leather vamp and collar. This boot provides maximum protection by combining thickness of leather and lining in order to withstand the strikes of venomous snakes. It has Bontex® insoles that provide a flexible and comfortable fit and allows for freedom of movement on the trail and a steel shank for stability. The Vibram® outsole offers traction on wet and dry surfaces as well as various terrain so this boot can go anywhere. These are my fourth or fifth pair of Snake boots. I broke the zipper on another pair and went in to exchange them. The only pair in my size was this pair. I don't like square toed western boots and had reservations, but the square toe allows more room for toes. a huge plus when on your feet in snake country all day.